We all love our boots. I know I’m safe in this assumption or else you wouldn’t be on this website. They’re a massive part of our game. If manufacturer’s are to be believed they can enhance our spped, mean the difference between scoring and hitting the post and, if some studies are to be believed, the mere appearance of your boots can tell the opposition what sort of player you are. But with all these things to consider and boots costing triple figure sums we thought we’d share some of our tips for buying a pair of boots. Are you a tough tackling centre-back, who values protection for his feet over an ultra-light, ultra fast speed boot? Something like the T90 Laser II’s or Concaves have added materials on the top for better connection with the ball, but it’s also another layer of protection between your foot and someone else’s studs! Maybe you’re a play-making centre-mid who wants extra power for the over-the-top long balls to the front men? Adidas have hyped the Predators for doing this for over a decade, and the new Predator Power incarnation is no exception. If you’re a lone striker who has to make every touch count it might be worth looking at something with a leather upper, Nike Tiempo Legends, Adidas Adipure & Copa Mundial or the Nomis Glove, for a great feel on the ball. This is a factor which can get easily over looked, despite it being one the main factors' when you buy the boot: FG or SG. For anyone who’s not sure what this means, FG is firm ground so that’s your plastic blades and moulded studs. SG is for soft ground surfaces, which are usually screw in studs and part-metal blades. Many newly built football pitches have a good drainage system and keep the grass cut short, so if you’re lucky enough to play on one of these you might be able to get away with FG boots all year round. When thinking about weather it’s also worth looking at the upper of your boots – if you know your home pitch is usually a mud bath in the winter it might be wise to avoid boots which offer superb ventilation, like the climacool uppers available on the F50.8’s and the Predator DB’s, as you’ll find your boots will get wet very quickly, and could even give you some pretty nasty blisters. Instead it’s worth looking at the amazingly waterproof Mercurial Vapour IV’s or Lotto Zhero G’s, which only have one piece of material for the upper, preventing any water leaking through the stitches. Does Colour Really Matter to You? With companies like Nike churning out new (and probably garish) colourways seemingly every month there’s a boot out there to suit everyone, but for those who aren’t too bothered there’s a great opportunity to save a bit of money. 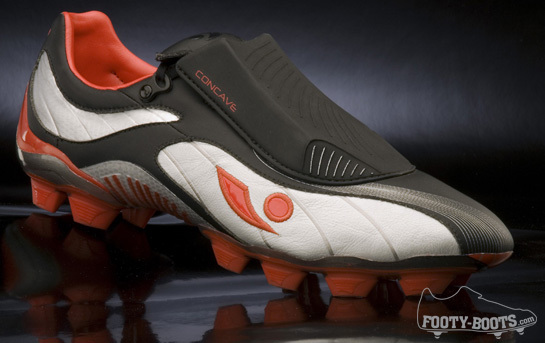 As new colourways' are brought into production some old ones have to be reduced in price to make some room on the shelves and there’s great example in the footy-boots.com store right now: While a pair of the new Black/White/Comet Red T90 Laser II’s will set you back over £100, whereas a pair of the exact same boots in Red/Metallic Silver/Team Red are over £40 cheaper – leaving you with some extra cash to treat yourself to some new Astroturf’s for the winter training sessions! Kyle – good luck with your new Footy Boots career. Cheers Fenboy! Means a lot coming form someone who’s a bit of a regular round here! Such a good point made. If you’re on a budget, buy an older colour boot. After a couple of games I forget what colour they are, well actually you can’t see what colour they are! The best time to buy boots is during the sales at Christmas and when the new season starts as last season’s boots get discounted. It is always worth checking sports direct as they seem to have all boots at a discount.